We have something a little different to usual on the blog today whereas it’s mostly all fashion related we thought we would add our second favourite thing in, food! So I hope you all like it. Myself and Emma decided to treat our Mum to an afternoon tea recently and thought why not take some pictures of our adventure out. We are both gluten free and this place catered really well for that and we left stuffed! Mum really enjoyed herself too. Looking back on the pictures it actually looks like we both went for a similar look style wise and I have only just realised this! Haha! You’d be surprised at just how often the pair of us end up either wearing similar or even buying the same item without knowing so. Emma’s coat is from Missguided and has been a key wardrobe piece over the colder months, it’s even perfect now worn with just a top or a body like Emma has. We are both obsessed with this one as it’s so usual with its mesh style look and also being a bodysuit. She added in her grey Joni’s (her fav if you hadn’t realised) and these lovely Ego boots. For my look I went for something similar with this long blazer from the lovelies at TNFC London. I’m obsessed with it as it can be worth in so many ways and looks really smart so perfect for this occasion. I matched it with this body from In The Style which is also gorgeous. It has lovely detailing and cut out sides. To finish my look I added my ripped Missguided Jeans and my pointed Primark boots. 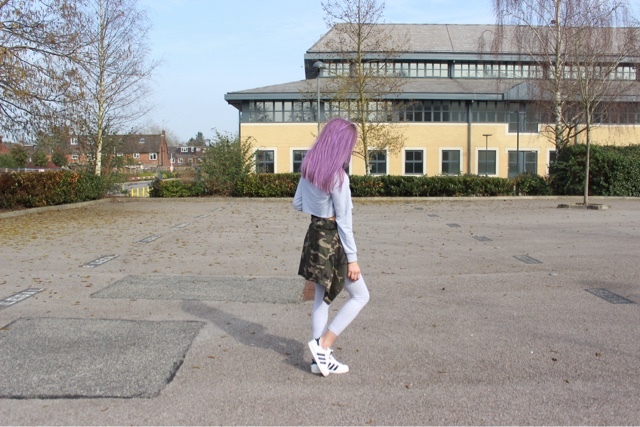 So today's post is a little different to the usual as I have purple hair! It was so fun to have a different look for just one day so thank you to Brite Organix! This post was such a nice change as for the first time ever I was actually not freezing so it wasn't a major rush which was great. I went for a super casual look today with these really comfy Asos leggings in light grey which matched up great with my hoodie which was cut short by Emma, (she gets a little scissor happy, she even cut her finger this evening with the excitement of cutting yet another top haha!) I added a bit of colour by adding my favourite camo jacket around the waist and our fav all star Adidas orginals. Lastly I wore this cute Blondes Boutique sunglasses which worked so well with the hair colour! I am in love with this casual look I have gone for in this post. It's a bit of me on a chilled day. It's really comfy and simple, a typical tom boy style. Emma and I shot these indoors for the first time as it was starting to rain and not to mention totally freezing so I hope you like them. We can't get enough of bombers, they are still a great wardrobe must have and come in so handy to throw over any outfit. This tee is one I got from Forever 21, I love a cropped tee and they are my go to with some plain black high waisted jeans, these are some of my Topshop favourites! This cap is my new ideal option for a bad hair day look, so easy to put with an outfit when you don't have the time to style your locks. To finish this I have added my Adidas Originals another item I couldn't live without. All of these individually are all great pieces to mix and match with different outfits.